This is PLC Program to implement totalizer in S7-300. Make PLC program to implement totalizer for flow meter. 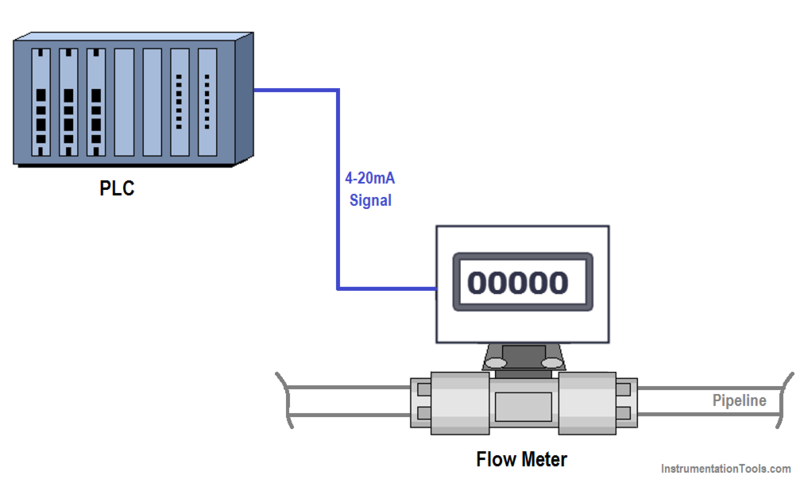 The flow meter has 4-20mA output that represents 0 to 100 liters/hour fuel flow in a pipe. By using this logic, we can calculate total fuel passed from the pipe. When totalizer value will reach to 5000 liters, then automatically it should be reset or we can reset the value using RESET button. We can solve this problem by simple logic. Here we consider a flow meter for measuring the fuel with maximum flow rate of 100 liters/hour. Here we will convert this flow rate from L/H to L/Sec by using DIV instruction for calculation. After then by using 1 second clock pulse, we will store this value in other memory location and every second new value will be added & updated. Here for example we consider max value for totalizer is 5000 liters so after this value totalizer should be RESET. So we will compare this value with actual value and reset it automatically or we will provide RESET button to reset the totalizer value. Here we have taken final output value of the flow meter in L/H (MD10). By using DIV instruction we converted L/H flow into L/sec and final value stored in MD18. Here clock pulse of 1s (M0.5) will add value every second and store the result in memory word MD22. Here we moved value of MD22 in MD26 (total fuel in liter) for display purpose. In this network we need to reset totalizer. If total fuel is greater than 5000 (5000 value is for example purpose, it is depended on flow meter configuration & it’s range ) then totalizer count should be zero automatically or we can reset by pressing RESET button (I0.0). Note: – Above logic is for explanation purpose only. Here we have considered only final output of the scaling, so we have not mentioned 4-20mA scaling in the logic.